The Dialogue blog came about when Jerry Fletcher was looking for away to cover a wide range of subjects much the way his freewheeling band of experts did over lunch when they could get together. His long years in the field and experience in both on and off-line business development simplify chairing discussions with this rowdy bunch. His latest project is the Brand Brain Trust. It is the legacy project he decided on when his energy level plummeted in the spring of 2016. After months of tests, the doctors found the problem. A single small pill each day brings renewed vigor and a passion to get you the Brand building knowledge you need to go it alone… successfully: Personal, Professional, Coach, Consultant, Start up, Company, or Product. 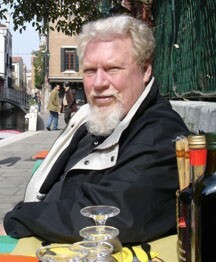 Jerry at a cafe along a canal in Venice. His definition of Marketing is: 1. Go where the money is. 2. Sell what they want to buy. 3. Do it again. The Z-axis name sums up his observations about winners. It comes from a youth misspent in pool halls and reading science fiction to learn how to see all the angles as well as a lot of years as a corporate marketing hand. Jerry founded Z-axis when he left his position as CEO of a successful Portland, Oregon business-to- business advertising agency. He was asked to bring his strategic assistance and proven processes to Positioning, Naming ,Branding and Business Development to all sizes of companies from garage-based high tech start-ups (Digimarc. which he named) to international Fortune 500 Companies (ADC Kentrox). This rainmaker is an old hand at both traditional and internet marketing with an in-depth understanding of what works and what doesn’t. He combines his skills at “Automagic” Marketing staying within your comfort zone while saving you money with integrated approaches that you can manage.